Recently, Dr. Kellyann Petrucci was on Daytime to talk about 7 great foods to eat in order to look younger. The way to “look younger and fresher with glowing cells and glistening eyes is to get the toxins out of the cells and nutrients into the cells. Creating these healthy cells and the fluids around them through seven essential foods is the true ticket to helping Mom turn back the hands of time, and, as a bonus, she’ll probably lose weight (over time) and begin to reverse any health conditions she may have.” This isn’t just for Mom though. Try incorporating these 7 foods into your diet to help keep those wrinkles away as long as possible. Vegetables with Probiotics – Sauerkraut or Kimchi are the most popular varieties here. Antioxidants are created from the fermentation process that help prevent wrinkles and enables the body to eliminate toxins. Bone broth – After cooking down bones, you are left with a broth that is full of collagen and will make your skin look amazing. Plus, its a great digestion aid. Coconut Oil and fats– According to Dr. Audrey Kunin, “Virgin coconut oil has an amazing ability to fight free-radical damage, presumably because it is rich in ferulic and p-coumaric acid. Consumed, this means these powerful antioxidants can fight free-radical damage and is now yet another tool in my wrinkle-busting arsenal. Applied topically, it has been shown to be useful in wound healing. A recent journal article put omega-3-rich fish oils head-to-head with omega-6-rich coconut oil. Guess what they found? A diet rich in omega-3 fish oil alone led to a significant decrease in the body’s ability to fight free-radical damage, presumably due to a noticeable drop in blood levels of vitamins E and A. End result, while fish oils decreased plasma blood fats, they created a challenge to the antioxidant defense system. 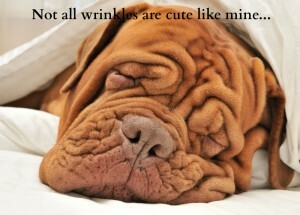 Not good news for banishing wrinkles. The best way to handle this for maximum skin health is to incorporate both omega-3 and omega-6 fats into your diet, both in moderation, of course. Another plus, coconut oil contains lauric acid which boosts immunity and fights infection. The only other major source is mother’s milk. Presumably for one prone to skin concerns that leave broken skin exposed to possible bacterial infection (such as eczema), having adequate levels of lauric acid could prove useful in reducing the risk of a secondary bacterial infection. Blueberries – Blueberries are high in antioxidants, Vitamin C, and can help collagen formation. Grass-fed meats – A great source of anti-inflammatory properties. Avocado – Another healthy fat to incorporate into your diet. Plus they are packed full of Vitamin E, potassium, and folic acid. The statements found throughout this site have not been evaluated by the FDA. They are not intended to diagnose, treat, cure or prevent any disease or condition. If you have a health condition or concern, consult a physician or your alternative health care provider. Always consult a medical doctor before modifying your diet, using any new product, drug, supplement, or doing new exercises.